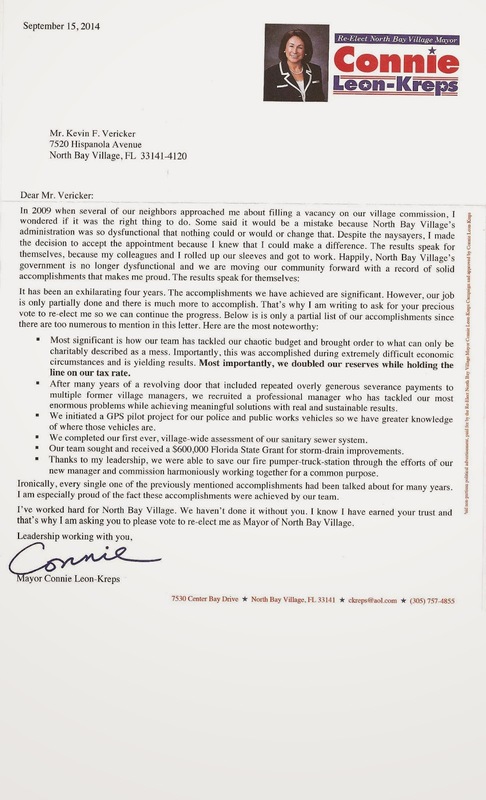 I received a mailer yesterday urging me to re-elect Connie Leon-Kreps as Mayor of North Bay Village. You probably received one too. It's a little hard to read in JPG format but if you click and zoom, it's legible. Based on the letter, I'd vote for that. But there are certain irregularities in what this candidate, let's call her Positive Connie, claims and what Real Connie did. Here's the letter from Positive Connie. by 22% and just voted to raise taxes another 13.5% for 2015 Held the line of tax rates. Village Assessment of Sewers Real Connie knows that the 2010 sewer assessment showed the same results as the 2014 assessment. But in 2010, she voted against hearing the item snce she did not care for the then mayor. The situation is dire and our sewers are rotted out. We knew that from the 2010 Sewer Assessment. The current Assessment is not available to the public, has never been on the commission agenda and has never been publicly workshopped. Also we paid twice. We completed our first ever village assessment off the sewer. Debunking over the top claims for votes is a fool's mission. It quickly becomes "I know what you are, but what am I?" But this letter is disturbing, not because of the blatant falsehoods, but I think Mayor Kreps believes its true. Seriously, Mayor Kreps has shown an ability to change her persona and her views to fit her delusions. We've all seen prevarication, but in her case, it's not a lie in the sense that normal people would understand a lie, it's an actual delusion. I am saving the worst delusion for now. In her letter, she writes, "Happily, North Bay Village's government is no longer dysfunctional." This is the ultimate delusion. Connie was responsible for the screaming matches at the commission meetings from 2008 on. When she took to the dais in 2010, she shut down every meeting by simply bellowing NO to whatever was proposed, has shut out any voice that disagrees with her, and then finally, when almost all the lambs in her head are quiet, she announces that she fixed the problem. Then she puts out a letter listing things she never did and boasts of them. The sidewalks are supposed to be pressure cleaned twice per year and we pay a contractor for that. They've done it once in two years. The commission spent less than an hour talking about the budget. Crime rates are up and police patrols are down. The sewers are now flooding our street regularly with actual sewage, not bay water. The PAL program was cut in 2010 and is not being considered for funding this year. So who do you believe, Real Connie or Positive Connie?